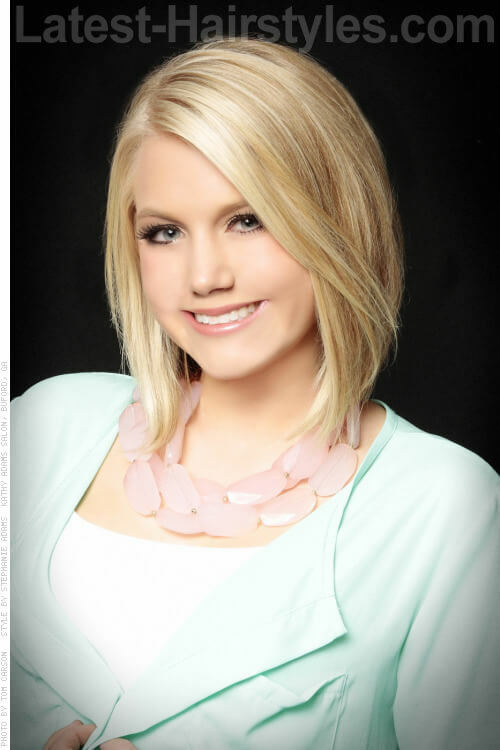 Are you a blonde looking for a change, but not a big change? Try some lowlighting to make your ultra blonde tones really pop! Lowlighting is a great way to add depth and dimension to any blonde shade. Plus, you can give your hair a gentle break from all that high-lift action and revitalize your stressed hair. Have some fun and try some creative color blocking and placement to maximize your hair’s potential. Take your blonde to the next level with pastel hues or fiery copper tones for a stellar look that’s guaranteed to help you shine! Whatever you decide, these ideas for blonde hair with lowlights are sure to inspire you. 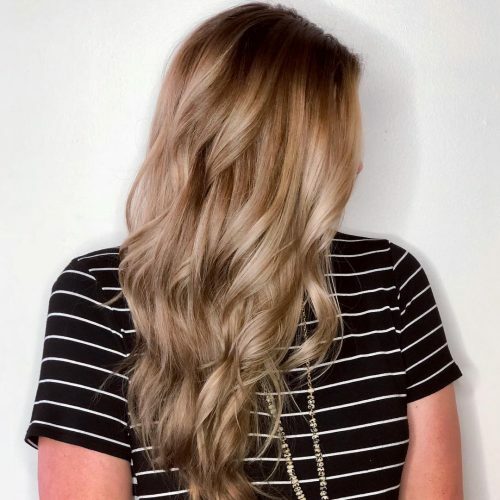 Stylist Amy Petersen painted this ashy blonde hair a little cooler to soften the golden tones and added some lowlights for dimension and depth. Everyone’s going lighter and lighter nowadays like this trendy color that is made perfect by adding lowlights into the icy blonde mane. Stylist Amanda created this long bob and added some lowlights that really make it pop. Athena colored, cut and styled and styled this very contrasting blonde with lowlights. This is a perfect example of coloring and styling for older women. This look is a bright blonde balayage with hair contouring. 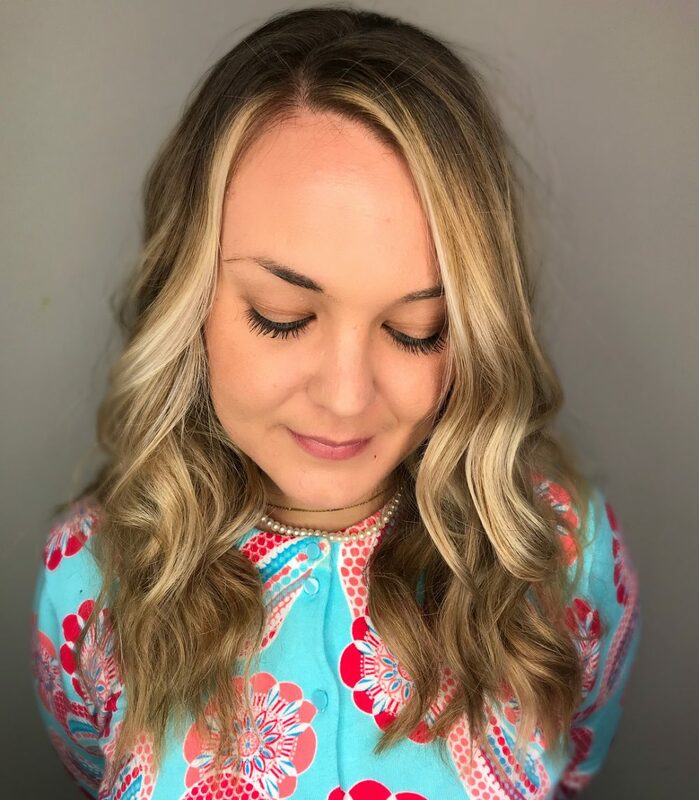 This client’s hair is naturally light, so I added specific pieces of depth to make her highlights pop, kind of like when you’d contour your face with makeup. 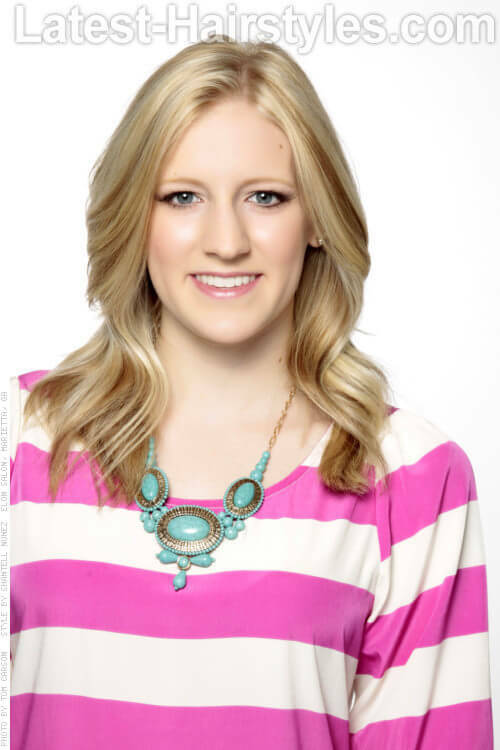 This is a great style for someone who is already blonde but wants depth and dimension added back in. It’s perfect for hair that has been over-highlighted all summer and wants to bring back dimension in while still looking like a blonde. This is the optimal beachy, Malibu Barbie, California girl look. 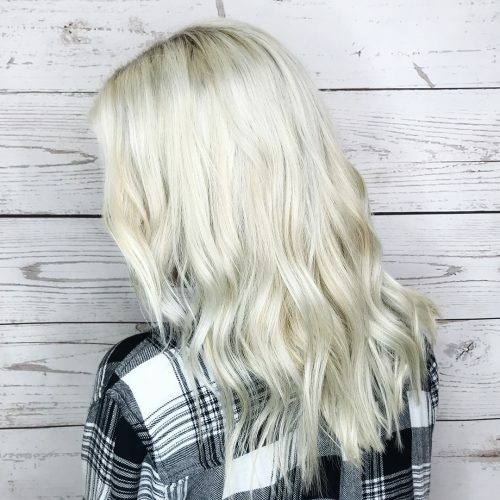 The perfect blend of sandy blonde, natural roots, bleached out ends, textured layers, and slight waves creates the look of spending hours in the ocean. The best about this hair is all of the dimension at the root, making it still look fresh in between salon visits. If you want this look, highlights and texture spray will be your best friend. Highlights give the sunkissed California hair to any natural base color. Highlighting your hair will also give it more of a texture on its own to hold those loose, beach waves. A texture spray or a very flexible hairspray will hold the waves and have a matte finish on the hair which has the look of being out on the beach in the sand and the salt water all day. I love the dimension and the variating tones. Hair naturally has several tones in it due to the sunlight and exposure to the elements in the world. One of my favorite things about this look is how natural it looks despite some of the lighter pieces giving it definition and movement. Anyone can wear this look. The beauty behind it is that it can be customized for absolutely anyone and their lifestyle, their hair texture and skin tone. With this hand painting technique, we can enhance the skin tone by creating some lighter pieces around the face and enhancing those with some darker pieces throughout the hair. The blending of the different tones is what makes this such a low-maintenance look. The different colors in this hairstyle will create movement as well as make fine hair look fuller. Like with any other hair color service, I would recommend the Eufora Bodifying Shampoo and Conditioner with the Damage Cure Complex and Vibrant Color Complex to help repair hair and deliver color retention. Followed by the Eufora Color Locking System created with the Sculpture Styling Glaze and the Illuminate Shine Mist, mixing these two will completely close the cuticle and seal the follicle for maximum color retention. The Eufora Smooth’n Straightening Balm will help to smooth and reduce frizz while giving you the benefits of straight hair or soft and voluminous hair. 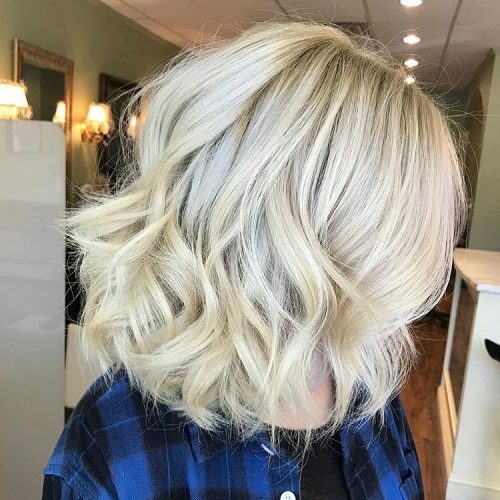 This is the perfect “lived in” icy blonde. 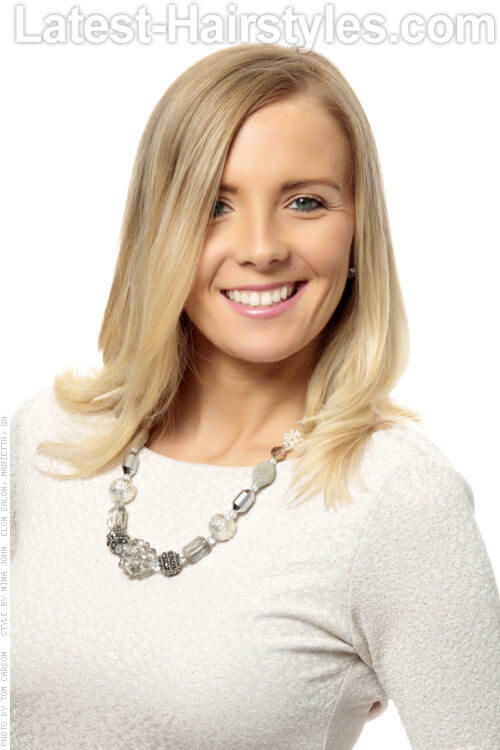 This is for clients who want that bold and cool blonde bombshell look, but have busier lifestyles and can’t commit to the normal frequent upkeep schedule. This is achieved by balayage + babylights (foils) to get that super light and cool blonde, and bold money piece. Also, by adding some lowlights for depth and to blend a shadow root for an easier grow-out process. This look is great because it can work for almost anyone! If your lifestyle is hectic, the blended lowlights and shadow root will give you extra time to go until your next visit. 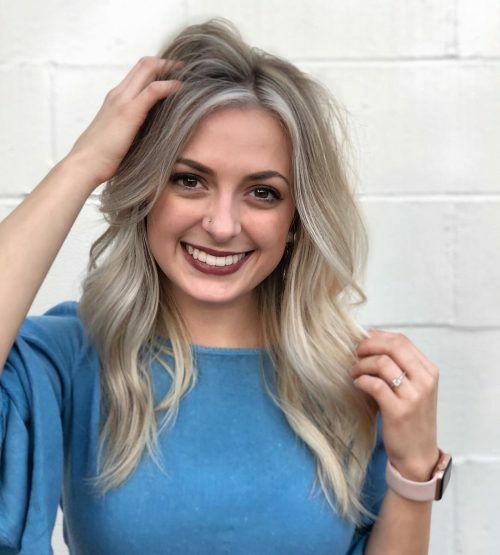 The bright blonde is perfect for bold personality types, and even someone who is more laid back (it could bring them out of their comfort zone). 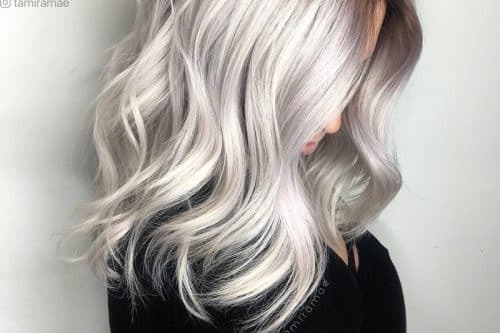 One suggestion would be using a purple shampoo/conditioner to maintain the coolness of the blonde and kick any brassiness to curb for at home service. This particular client had about eight months of regrowth and faded ends. I wanted to keep her light and bright, but also added a dark blonde base color and lowlight to keep it natural as it grows out. To achieve the blonde, I balayaged and foiled in babylights. For the cut, I wanted it to be easy to maintain but with lots of texture. I like that you see different variations of color throughout the blondes and lowlights, giving it a natural look. This type of look is easy to style. The length works well on almost any face shape and is great on fine to medium hair textures whether you wear it straight or add some beachy waves. I love using Kenra’s Blow Dry Spray for shine and Root Pump for added volume as I blow dry. You can finish with a wand or curling iron to add those fun waves and piece them out with a pomade or texture spray. Overall, if you are a natural dark blonde and want to brighten it up but blend in your regrowth, this is a great style for you. I would describe this look as easy to maintain and a very natural look since we added lowlights. It’s a look that many people can pull off whether or not they have time to style their hair, which is my favorite thing about this look. 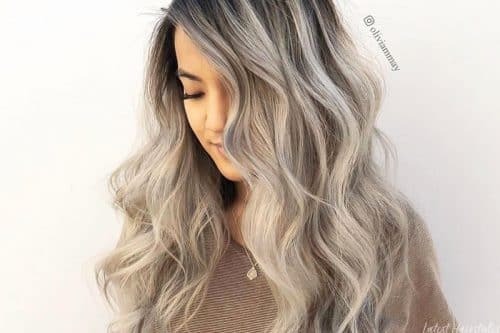 Some advice that I would give to a client who is considering this look would be to realize that it may be a process to achieve, depending on the color of their hair. However, the good thing is that this look is great for any hair type and face shape. The best product to maintain this look would be a sulfate and paraben-free color-protecting shampoo. If you have a laid back personality and an easygoing, natural lifestyle, then this look would be perfect for you! 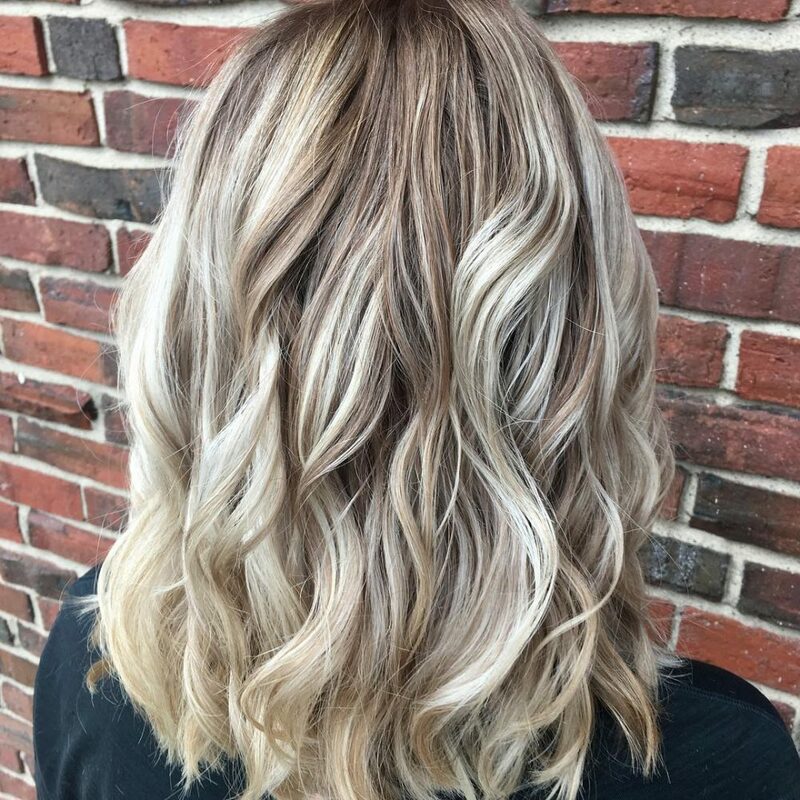 A multi-dimensional blonde is one of my most requested color looks. She started off being a heavy highlighted blonde. Lowlights were added to bring back her base and natural color. The lowlights also add contrast, thus enhancing her blonde pieces. This lower maintenance look is perfect for a busy lifestyle. Dimensional blondes are my absolute favorite! 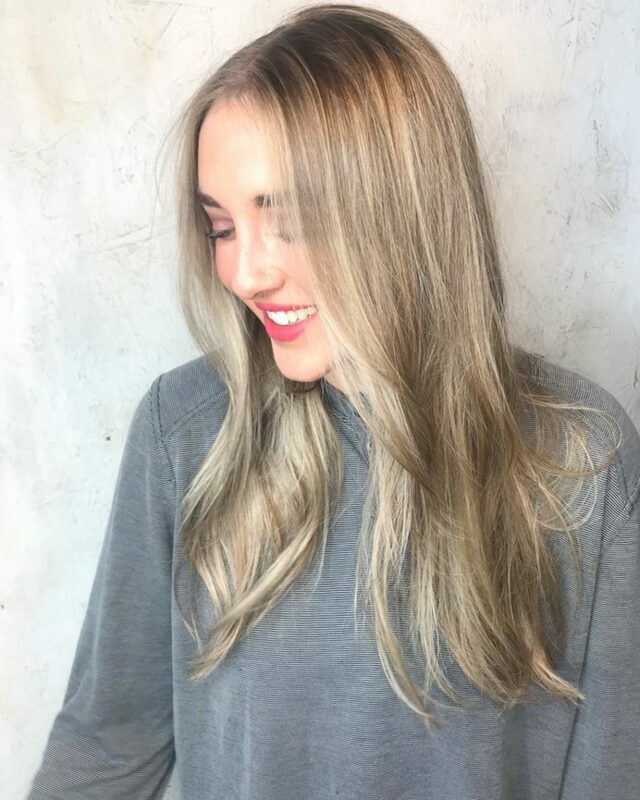 My client came in with an all over blonde look and wanted to be cooler with more dimension. She also wanted to get away with going longer in between appointments. We did a full balayage on her with foils and did an 7 p on everything that was left out. My favorite thing about this look is that it makes her hair look fuller and give her the dimension she needs. She doesn’t have to style it every day to have messy, effortless hair. If this is the look you want, you have to remember that not all of us are lucky enough to have hair that is easily lightened. It might take a few times to get you there. I think this look is great for anyone who needs something new or just wants to have the look of fuller hair. Each balayage is different according to face type and the placement of lowlights. You really want to highlight your client’s features! In this case, we wanted to elongate her face, so we brought the blonde higher around her face with lowlights highlighting her cheekbones. To maintain this look, purple shampoo is an absolute must. It just keeps everything fresh and cool. My favorite purple shampoo is Surface Pure Blonde. 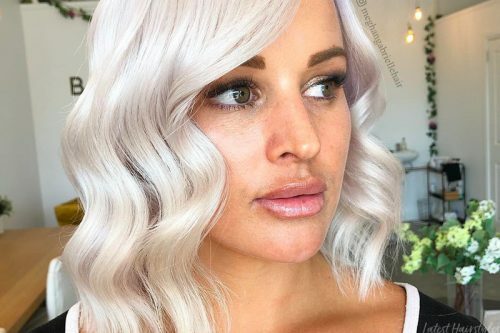 I think this a great look for anyone who can’t get into the salon as often as they would like, but still wants to feel blonde around their face for a long time! I recommend coming in every eight weeks to get refreshed, but some of my clients push it to 12 weeks and still love their hair! 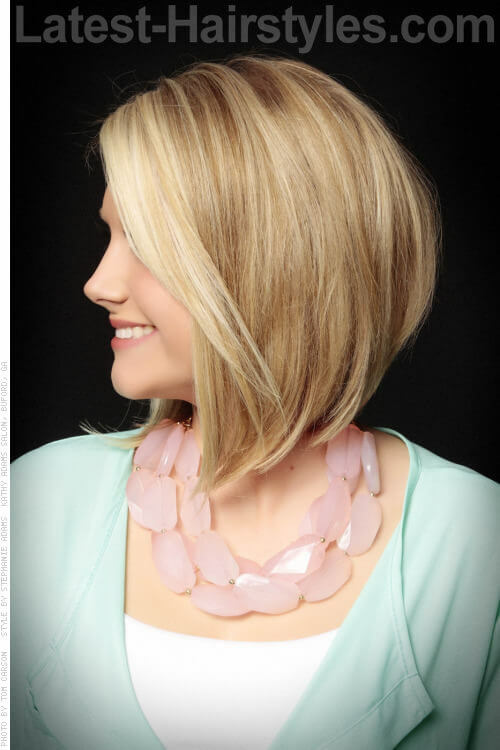 This is a beautiful way to get into ”the blonde vibe” without compromising the health and the strength of your locks. What I like the most about this look is definitely the dimension and depth it creates while being so easy and quick to create in the salon. It will definitely stand out a lot more than classic highlights! Give it a try! 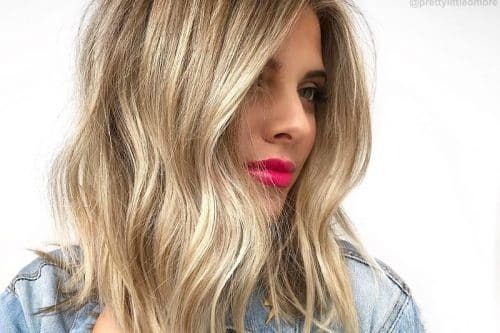 If you’re used to regular highlights and you want to brighten up your global look, or if you have fine hair and are looking for a way to add thickness and volume to it, this is a great way to do it. 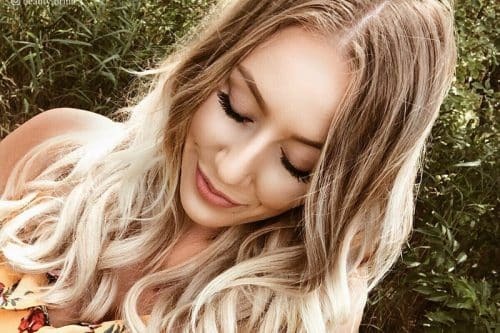 Lowlights look gorgeous on any type of blonde, but also on darker tones. 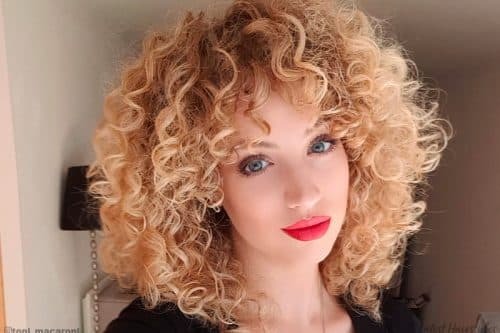 This hair technique looks amazing with either naturally wavy hair, on some quick loose curls, or even with a quick blow dry. Lowlights are great to rock during winter as they are usually on the cooler side. They’ll surely pop with the white snowy days! There really are so many benefits to this technique, why don’t you give it a try? This blonde lowlight is a very inartificial change in color. What I love about it is the smooth but still astounding complexion of colors. It makes people turn their heads on the streets but still gives you that decent natural look. This look perfectly suits women with a warm spring or autumn color hair type, ideally with light brown to blond hair. Since the hairline is darker, a rejuvenation of color is only needed every three months. Most of my clients with a busy schedule and a jet-set lifestyle prefer that. Hair care is key to all long hair though. We recommend a conditioner and a hair mask from time to time. This is a shadow root color with highlights. 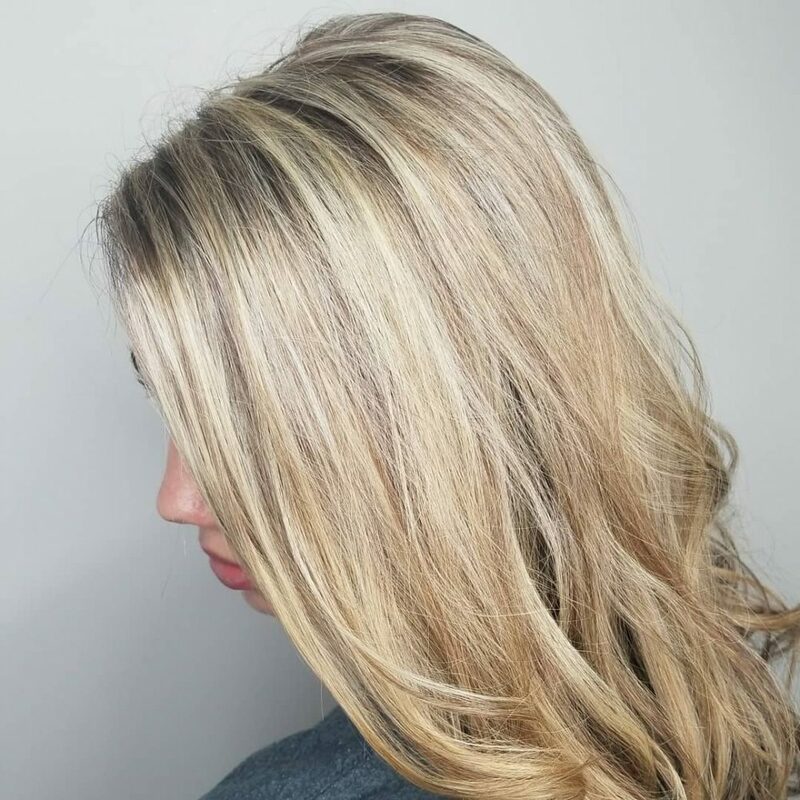 This client had come in with two inches of outgrowth from a previously overprocessed blonde highlight and was looking for a more natural look that would soften her outgrowth in the future. 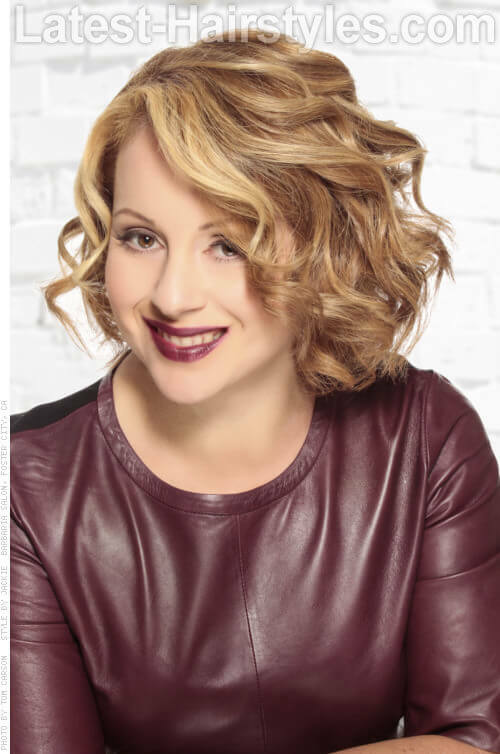 My advice to clients looking into trying a shadow root is to start with a thorough consultation with your stylist. 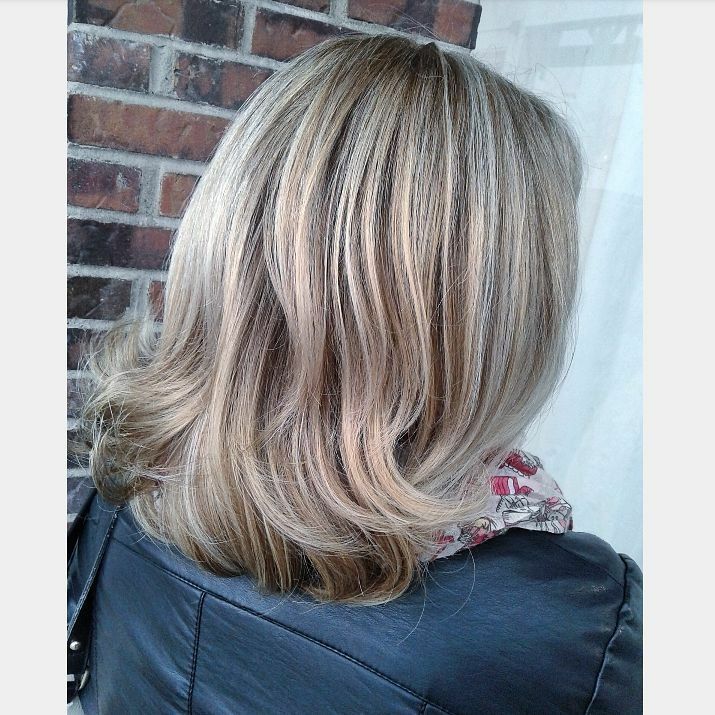 This client loves being light and blonde, but did not want to have the same outgrowth as her previous highlight service. I let my client know her outgrowth will be “rooty” and softer compared to a harsh line of demarcation and she will need to be back for a touchup every six to eight weeks. 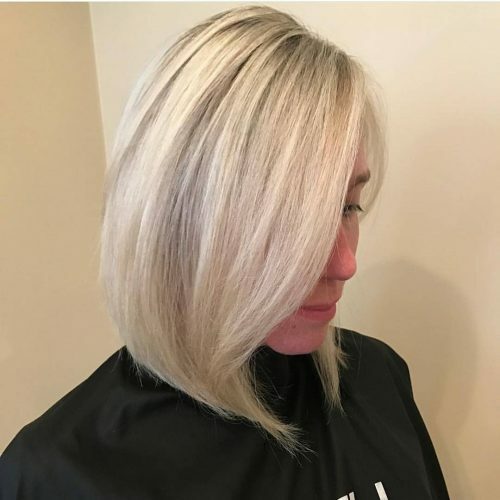 She went home with our Paul Mitchell Platinum Blonde Shampoo to keep her highlights looking great between appointments, as well as Paul Mitchell Awapuhi Styling Treatment Oil for added moisture and shine. 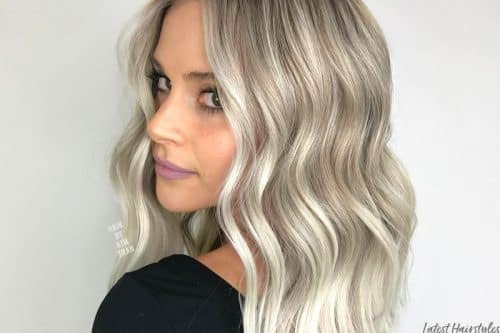 This look is great for those who would like to try a subtle change from their usual highlights and who are also looking to be part of the new trends. I would describe this look as a dimensional honey blonde with blended natural lowlights. 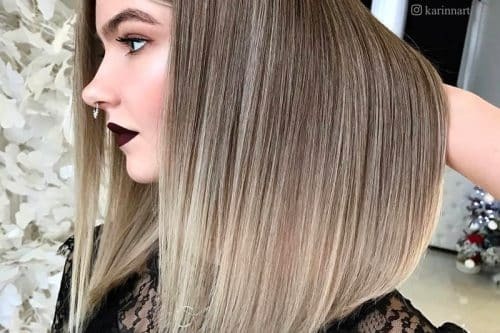 My favorite thing about this look is how the placement of the lowlights adds contour to create somewhat of a faux “shadow root”, while the highlights keep brightness around the face and throughout the layers. 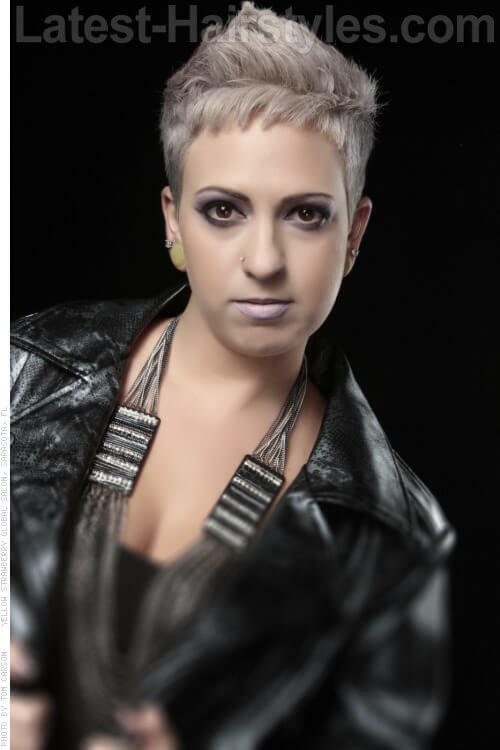 To create this look it is best to formulate the lowlights within a two level range of your guest’s natural color. For this client, I highlighted with Paul Mitchells Synchro Lift and 20vol, and lowlighted with Paul Mitchell Color xg 20grams 7nb 10grams 6n and 10vol. I finished by toning at the bowl after shampooing with Paul Mitchell The Demi 1oz 9g 1oz 9N and processing solution. Upkeep on this look depends on your guest’s preference. If they don’t mind a rooted look, they can go about eight weeks and have a nice natural blend with the placement of the lowlights. I add B3 bondbuilder to all of my formulas to protect the hair from damage and prevent the color from fading. This style is best suited for guests looking for a medium maintenance color. The color is suited to hair of any density and the dimension can actually create the illusion of thickness to thinner hair. On naturally curly hair, I would incorporate more highlights in the crown area. Golden blondes are best suited to fair complexions with warm undertones. This style would be apropriate for any lifestyle that allows for pretty hair. It looks great finished with sweeping curls, a smooth blowout, or a beach wave. I would describe this look as a dimensional balayage. It is important to understand what kind of look the client is wanting with balayage. Do they want to see light and dark, or would they prefer solid blonde at their ends? 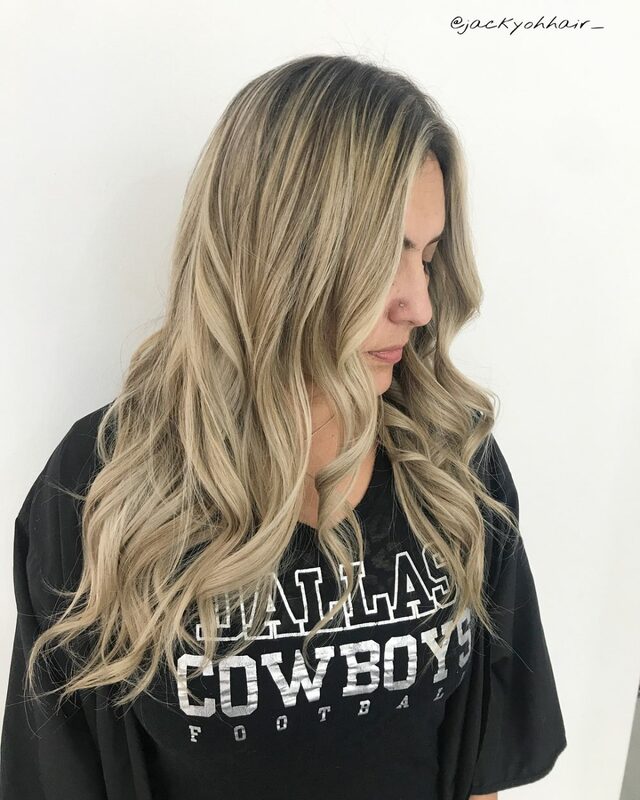 In this case, my client had been very blonde from years of traditional foil highlights and we have slowly been transitioning her to balayage. I wanted to break up the blonde on her ends with large panel lowlights to match the depth at her root so she would have light and dark throughout her hair. 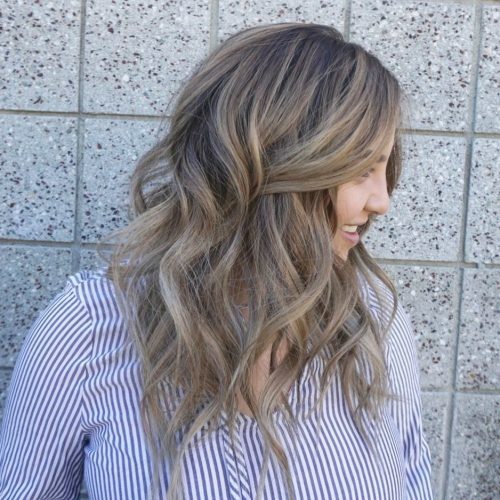 Balayage has given her a more natural lived-in look and grows out tremendously better than foiling, which works for her since she is looking for a lower maintenance look. In order to maintain this look, I recommend a good purple shampoo and a heat protectant. In my client’s case, I used Kevin Murphy’s Blonde.Angel shampoo and followed with Blonde.Angel Treatment. This is a wonderful purple shampoo and it’s also sulfate-free to hold her toner and lowlights longer. I also used Kevin Murphy Untangled which is a spray leave-in conditioner and heat protectant. For styling, since her hair texture is fine, I use Kevin Murphy’s Anti.Gravity for volume and Doo.Over for added volume and texture. In order to achieve these loose waves, I used a tapered wand and took one inch sections. I prefer to use Paul Mitchell’s Neuro Wand. This type of look works best for people who have shoulder length or longer hair. I do a lot of balayage and the majority of my clients have a “lob” (long bob) or longer hair. I recommend this for people who have a natural level 6, or darkest blonde level of hair, unless the client is going for a high contrast look. I do not think it is necessary to curl your hair if you have balayage as long as it has been blended well. 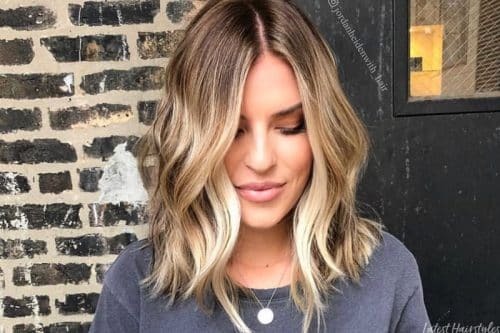 I love to see balayaged hair work straight too! I also recommend this for people who are looking for a lived-in color that grows out well. I would say this look is fun, and appears effortless as far as the color goes. I love that it looks dimensional, but also has a shadowed root so the growout isn’t so harsh like it would look when you get highlights. It’s more transitional. I for sure recommend sulfate-free and color-safe shampoos! My favorite shampoo is the Repair.Me wash and rinse by Kevin Murphy, along with the Blonde.Angel treatment. Shampoo is important for colored hair because it definitely helps keep the color in tact and prevents the color from fading so fast or getting brassy. I also always reccommend that my blonde clients to use a purple shampoo or treatment to help maintain a pretty blonde color at home! I love this look on tan or olive colored skin, but I also feel that it’s very versatile with skin tones. 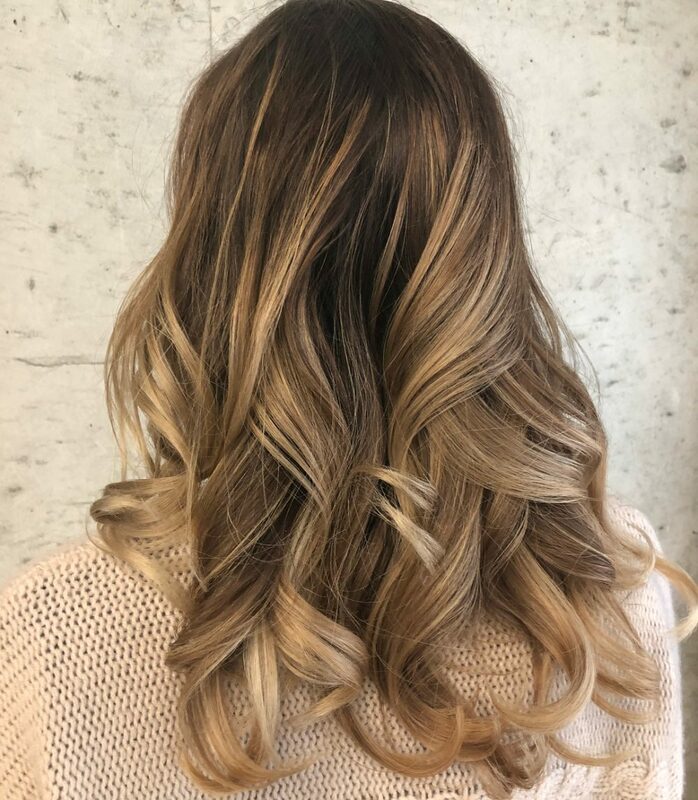 This look is good for a busy girl that loves a big change, but doesn’t always have time to be in the salon every few weeks to do a highlight touch up. It has just enough dimension to create movement, especially when it’s worn in a beach wave. The shadowed root helps it look more modern and allows the growout to be smoother and intentional. Bold, deep, golden blonde lowlights are perfect for fine or thin hair to create the illusion of thicker strands. Add some curl or wear it wavy to break up the heavy placement. 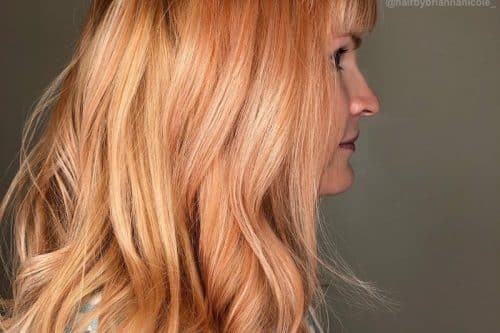 The natural golden tones of this blonde shade best suit a slightly pink/peach complexion. Naturally light, fine hair (level 9) benefits most from level 7-8 lowlights. Try a simple low ponytail with a slight twist for a trendy look. It’s a joy to see a hair color and cut in harmony. The angle of an A-line bob naturally draws your attention forward, so keep your lightest and brightest blonde tones near the face. Finely blended golden lowlights smoothly transition to a darker finish in this chic look. The cool golden tone of this blonde best suits a slightly yellow/golden complexion. Naturally light, fine hair (level 9) benefits most from level 7-8 lowlights. Boost fine hair with a little backcombing. 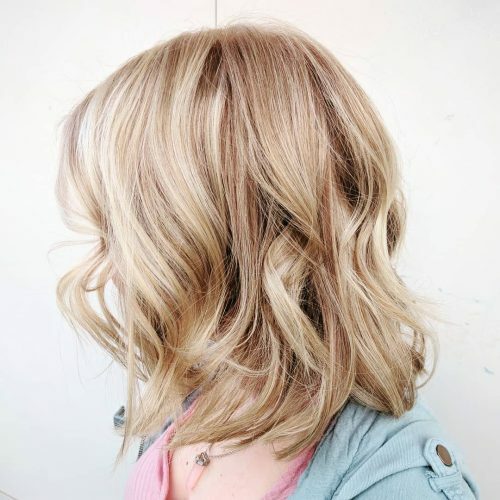 Here’s a cool way to transition from a overall high-lift blonde look. Add some medium ash/sandy blonde lowlights to break up your hair color. 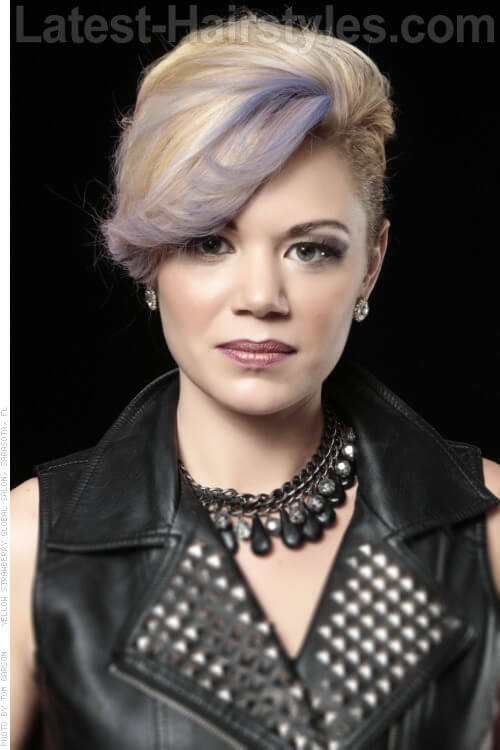 This is a fun color to twist into an updo or a textured braided style. Be sure to keep color nearest the face the lightest so you don’t go into color shock. The cool gold tone of this ‘bronde’ (brown/blonde) best suits a slightly yellow/golden complexion. Medium light brown, fine hair (level 7 and up) benefits from level 5-6 lowlights. 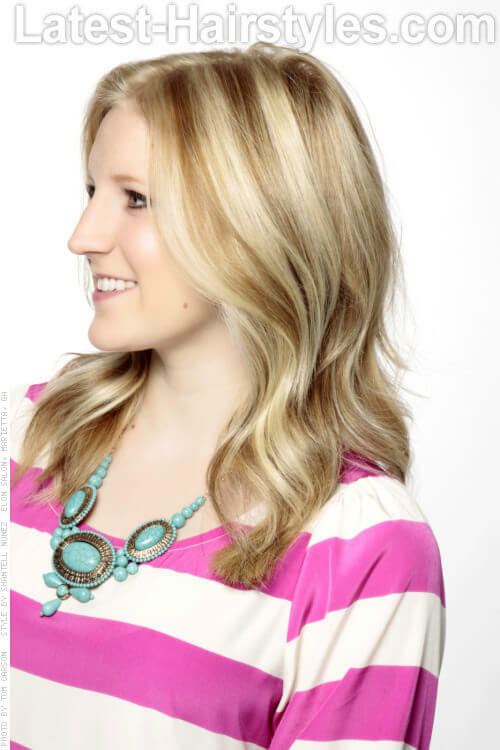 Create soft, loose waves to accent this hue by wrapping strands around a large barrel curling iron. Lowlighting doesn’t have to mean adding brunette tones to your hair. Try some pastel hues or smokey tones for a temporary change. The cool thing is that they’ll gradually fade out, leaving you blonde once again. The interplay of warm and cool blonde tones best suits a slightly yellow/peach complexion. Naturally light, fine hair (level 7 and up) benefits most from cool pastel tones. Keep the focus on you by only accenting the fringe and face frame. 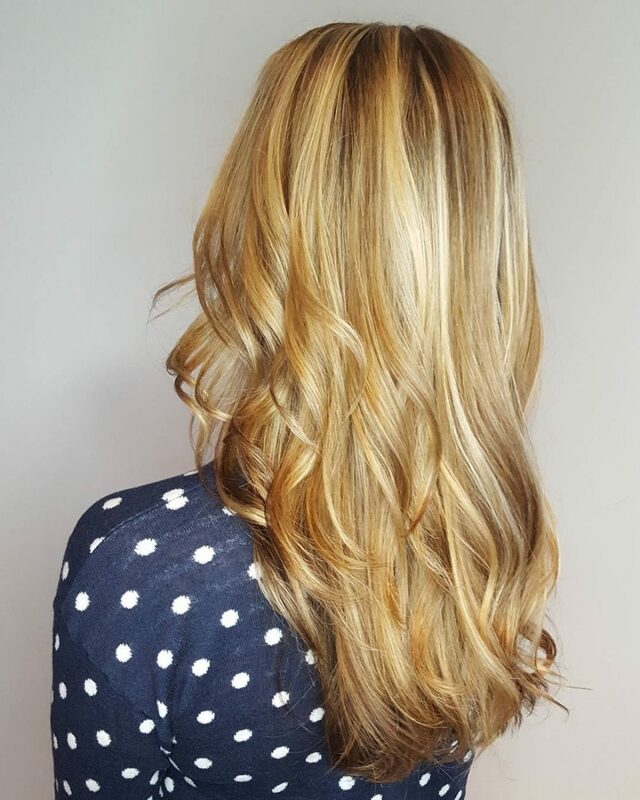 Deep golden brunette tones liven up this light golden blonde beauty. Keep the contrast deepest at the base and gently transition to lighter ends. Mix it up with an extra lowlight hue that’s ‘in-between’ to add an extra dimension. The warmth of this blonde best suits a slightly golden/peach complexion. Naturally light, fine hair (level 8 and up) benefits most from level 7-8 lowlights. Create long, beautiful waves using a large barrel iron (vertical position) and loosen them using your fingertips. 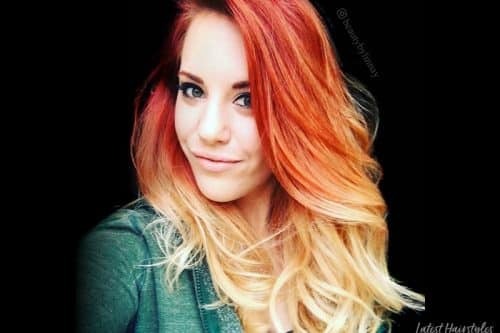 Here’s a refreshing way to update your ombre hair. Try a medium sandy/gold hue to deepen the base through mid-lengths, keeping the ends super blonde. Keep some lighter, finely sliced strands out nearest the face for a soft transition. The natural golden tones of this blonde shade best suits a slightly pink/peach complexion. Naturally light, fine hair (level 9 and up) benefit most from level 7-8 lowlights. A gently tousled bun is a sweet style to balance these tones. Want to keep it ultra-blonde but need a change? 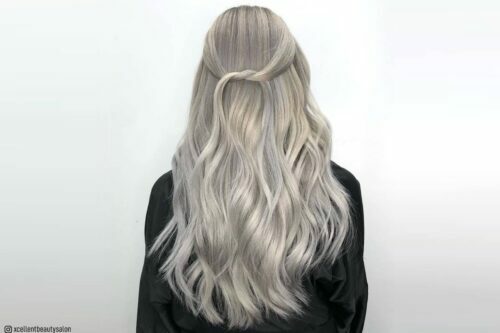 Try this smokey silver tone to cool off your hue yet still maintain blonde bombshell status. The cool tone of this blonde best suits a slightly yellow/golden complexion. Naturally light, fine hair (level 7 and up) benefits fmost from a smokey hue. Boost your conditioner with some color to refresh your tone easily. 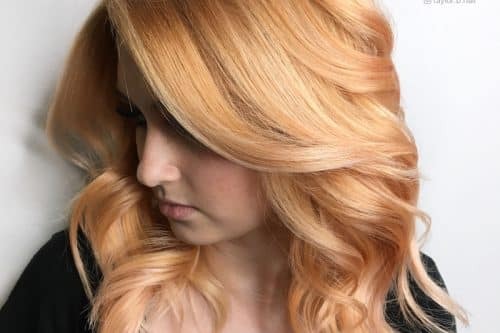 This fiery copper hue is a great way to add brilliant, shiny contrast to your golden blonde hair. Keep it rich at the base with some bright streaks near the fringe and transition to a soft, golden-hued ombre style. The richness of this red best suits a golden/peach complexion. Medium warm hair (level 7) is a great foundation for this hue. Slight, cascading waves give this rich dimensional red extra volume and shine. Soften your golden blonde hair with a blend of dark and light caramel tones. This is a perfect way to refresh and nourish thick and/or curly hair. This interplay of sandy and golden blonde tones best suits a slightly yellow/peach complexion. Naturally light, fine hair (level 7 and up) benefits from added warmth for a youthful glow. Wrap hair loosely around a large barrel curling iron for a soft, wavy look.